Election Day in Haiti. 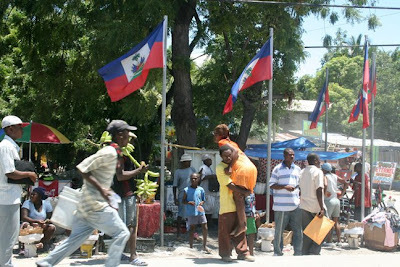 Most Haitians boycotted the elections because they call them a joke. 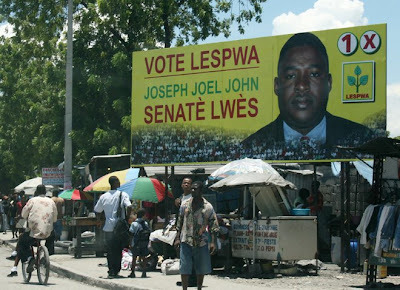 Some of the political parties, such as Aristides' supporters, the Lavalas Family Party, were banned from participating in the election. 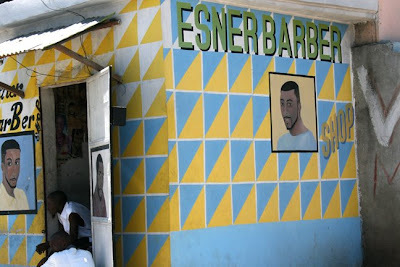 A creative barber shop that we saw as we were stuck in traffic leaving Port-au-Prince. It must have taken about 45 minutes or an hour just to get out of town. I shot this picture from our rental truck. I'm not sure what's going on, like why the guy is carrying this woman or why the other guy is running. The flags are up for election day. 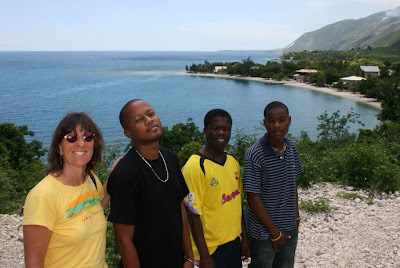 My goal was to drive up the coast as far as Gonaives so we could see the damage from the hurricanes of 2008, such as Ike, Hanna, Gustav and Fay, which battered Haiti. 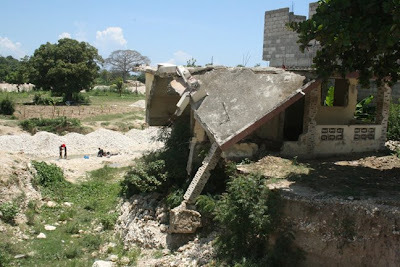 We started seeing destruction even before arriving in Gonaives. We passed many beautiful beaches, mostly empty like this one. Our companions on the road trip -- a neighbor named Jean-Milaud, our buddy "Coach" and Andre's younger brother Reginald. 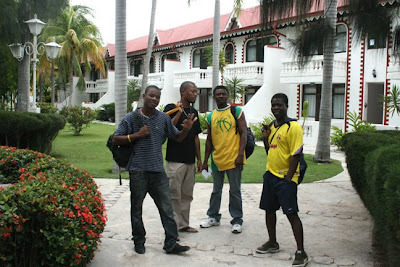 Here are Reginald, Jean-Milaud, Andre and Coach at the Moulin Sur Mer resort where we paid $15 each for the day, $10 of which was given back in food and drink credit. The resort was built was built in the early 1800s as a sugar plantation. Their website claims they have 63 air-conditioned rooms, but the only guests we saw were two couples, the guys were living in Brooklyn, NY and their "girlfriends" were local women. 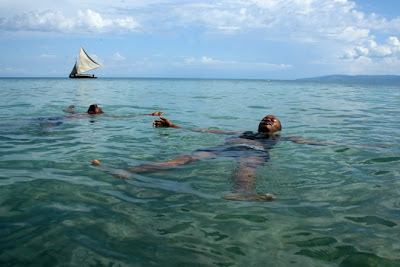 The small beach and warm coastal waters were wonderful. Andre and Jean-Milaud relaxing in the ocean. 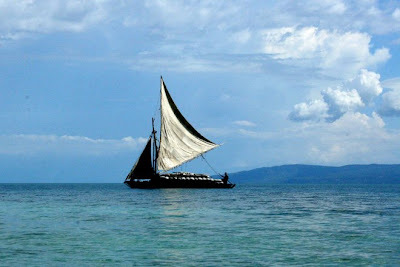 This sailing boat was bringing charcoal down from Saint-Marc to sell in Port-au-Prince for cooking. Natural or propane gas is too expensive, but using charcoal has resulted in 95% deforestation in the country of Haiti. 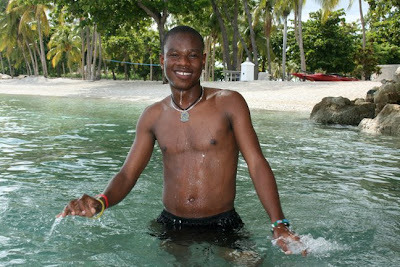 Reginald, Andre's younger brother, doesn't know how to swim, but he enjoys the water. The pool and the food were both very nice at Moulin Sur Mer. Their website says it's just 1 hour from the airport, but that would be possible only if there weren't any other cars, buses, motorcycles, tap-taps on the road. I'm sure it took us at least 2 or 3 hours. The highlight for Andre and me was a beautiful 3-wall outdoor racquetball court. We asked to borrow the racquets and balls, which were first quality and seemed to be never used. This was only the second racquetball court we've seen in Haiti. 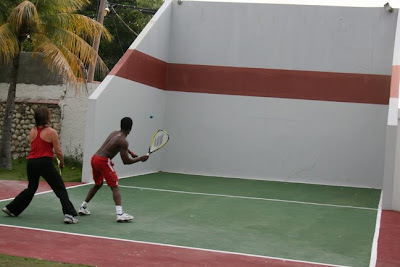 The other one was also a 3-wall court in Port-au-Prince at the Coconut Villa Hotel. But they wouldn't even let us hit one ball there, even though we gave them some old racquets and balls as a gift. Their court wasn't even half as nice as this one at the Moulin Sur Mer. 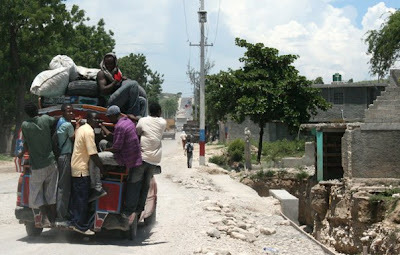 Typical transportation - tap-taps - in Haiti. You can't really see from this small picture, but there is damage from last year's flooding and hurricanes on the right side of the picture. 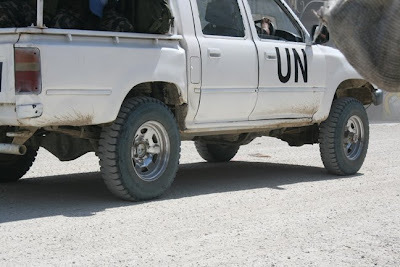 U.N. trucks and soldiers, called MINUSTAH, are everywhere, but Andre keeps warning me not to photograph them. He's afraid they'll mistake my camera for a weapon and shoot me. I shot this picture "from the hip." Since the U.N. presence is so huge there, I didn't feel my blogging would be complete without one shot of the "peacekeepers." 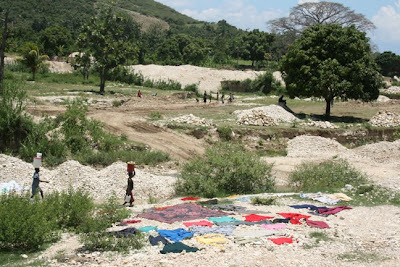 Wash Day in Haiti, on the way to Saint-Marc. 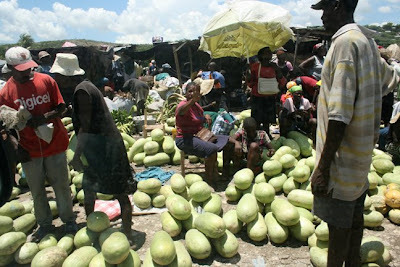 Watermelon market. We bought one on the way back to Port-au-Prince for Andre's family.